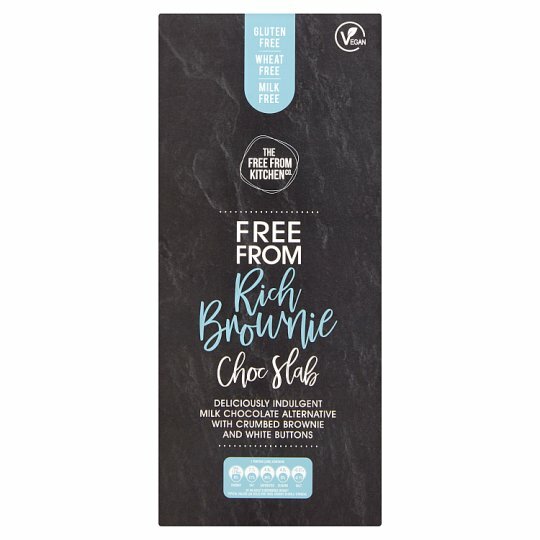 Free From Rich Brownie Choc Slab Deliciously Indulgent Milk Chocolate Alternative With Crumbed Brownie and White Buttons. INGREDIENTS: Sugar, Cocoa Butter, Rice Flour, Cocoa Mass, Inulin, Brownie Powder (5%) (Gluten and Wheat Free Flour (Maize, Rice, Potato, Tapioca, Buckwheat), Raising Agents (Mono Calcium Phosphate, Sodium Bicarbonate), Stabiliser (Xanthan Gum), Vegetable Margarine (Vegetable Oil (Palm, Rapeseed), Water, Salt (2.1%), Flavourings), Sugar, Cocoa Powder, Concentrated Grape Juice, Natural Vanilla Flavour), Maltodextrin, Emulsifier (Soya Lecithins), Maize Flour, Coconut Oil, Flavourings. Dairy Free Choc contains Cocoa Solids 42% Minimum. May contain peanuts. May contain peanuts and nuts.. For allergens, see ingredients in bold.